I am so excited!! Bear is going on his first longish road trip this weekend, where he will get to meet one of his aunts and uncles! We typically drive four hours each way every weekend back up to our home in the Adirondacks, but this will be an 8-ish hour drive each way with just him and I, and it will be the first time we are staying someone where other than my house or my Dad’s house. While I am a little nervous, we are just going to my aunt’s house. She has all kinds of animals and they are both pet lovers, so I’m not as worried as I would be if we were staying some place else. After all, it was Toby who one of the times we stayed there was so nervous he pooped on the bed we were sleeping on – twice. That said, I still want to make sure Bear is a good house guest, so I figured I would share some tips on what we are bring, and doing, to help set us up for success. Anyone who know me, knows I am a big advocate for good crate training. This is one of the reasons why. If Bear gets fussy, or doesn’t get along with my aunt’s dogs, I can put him in his crate with no worries. It is also good for when we are out of the house. I don’t like to leave my dogs loose in an unfamiliar place both for their safety and out of courtesy for wherever we are staying. 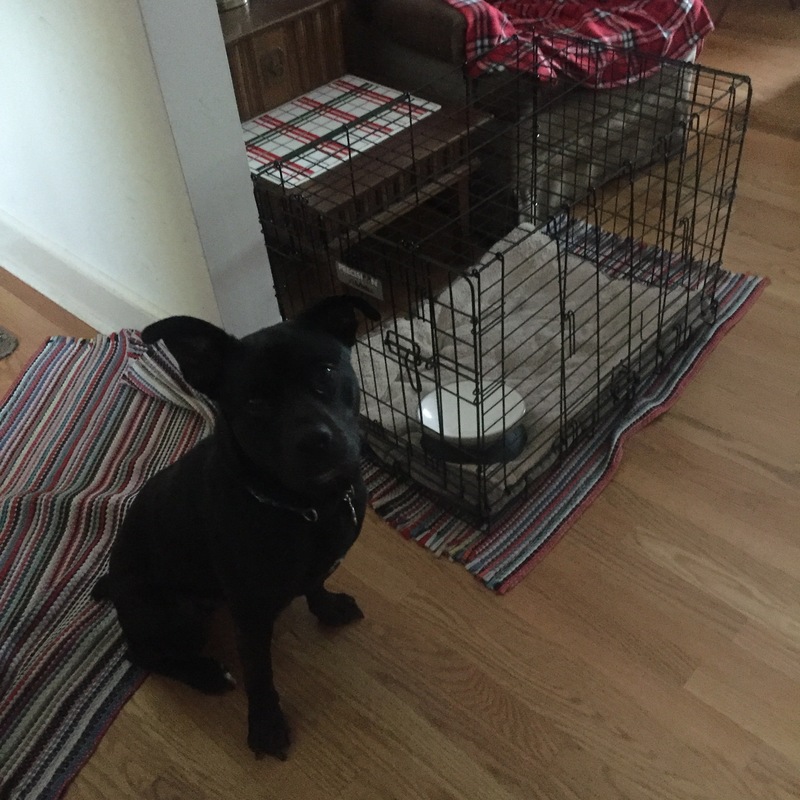 Bear loves his crate and it’s also a safe, and familiar, place he can go to relax if he gets stressed. 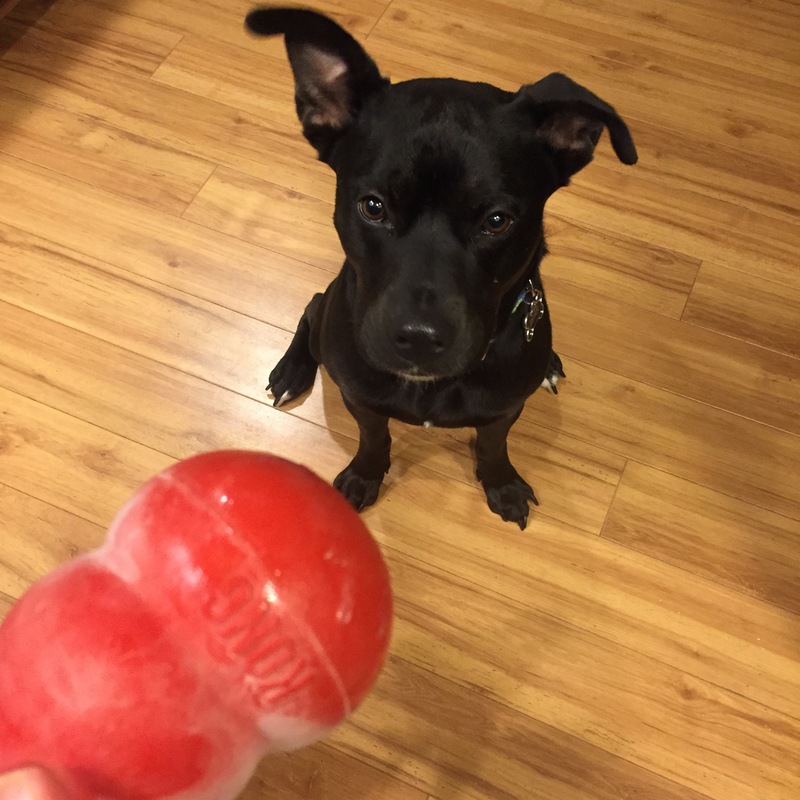 Bringing their favorite toys, treats, blanket, leash – anything that comforts them will work. For Bear, it’s his crate pad and really any toy. This includes, an antler so that he has something to chew on. I am also brining his regular food dish. Especially since this is the first time he is traveling like this, I want to make sure he has all the comforts of home. In the dog world, this means taking all the little things you need, or may need. For example, poop bags, a scoop for food, any medications they may need and baby wipes for a quick clean if needed. I also usually bring wound spray and a few other first-aid items, as well as a multipurpose cleaner and paper towels for clean-up. 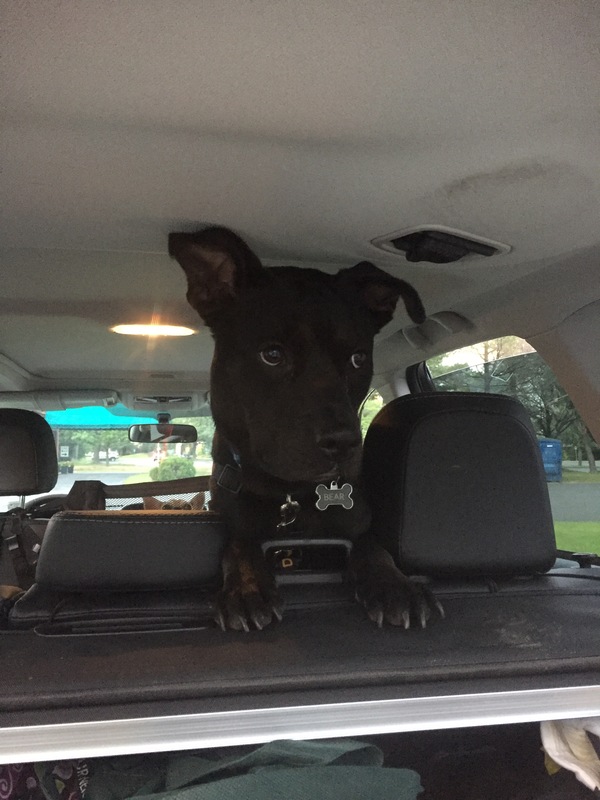 Years ago on a trip from Virigina to New Jersey with Toby, I learned that having “extras” of several different things, is well worth the space it takes up. He threw up all over the front seat of my car about hallway home. Having extra blankets, leashes, paper towels and plastic garbage bags came in handy. We will be packing those as well, just in case! Make sure you are following us on Instagram and Facebook (links to both can be found on the side of this site) to follow our little adventure!